Boy with post-vaccine lollipop reward poses with doctor, 1955. Department of Health Collection, NYC Municipal Archives. 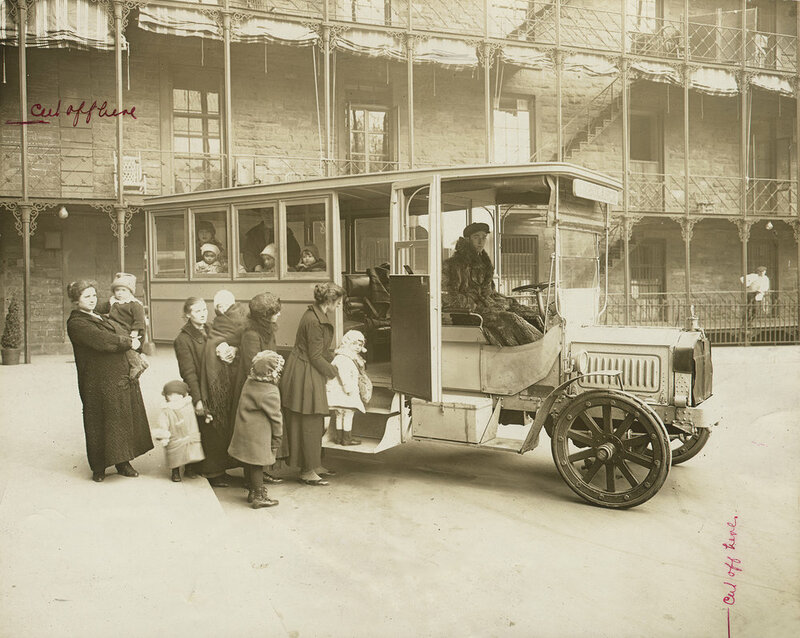 Mothers and small "Polio Children" board bus, Bellevue Hospital, ca. 1916. Department of Public Charities Collection, NYC Municipal Archives. The city’s first major polio epidemic struck in 1916, killing nearly 2,500 people. Almost 9,000 cases were reported in total that year. Smaller outbreaks were reported over the next few decades with two occurrences in the 1940s, continuing to terrify the populace. On average, over 800 cases and 40 deaths were reported yearly. Girl gets injection as part of National Foundation for Infantile Paralysis vaccine testing, undated. Department of Health Collection, NYC Municipal Archives. Doctors were soon developing and experimenting with preventive treatments including gamma globulin, an injectable solution made with the polio antibodies. Gamma globulin was introduced to the public in 1950 and showed some effectiveness in preventing the disease. Because the solution was made from blood, supply was limited and could not be a long-term remedy. Parents’ desperation to protect their children coupled with the restricted availability of the treatment led to sit-ins and protests demanding more access to gamma globulin from the Department of Health. Department of Health mailer from 1954 explaining the vaccine testing. Department of Health Collection, NYC Municipal Archives. Letter from pharmaceutical manufacturer Eli Lilly confirming Commissioner Baumgartner’s order for 500,000 units of the polio vaccine. Department of Health Collection, NYC Municipal Archives. In the early 1950s a vaccine developed by Dr. Jonas Salk at the University of Pittsburgh looked promising. The vaccine was created with an inactivated polio virus. In 1954, New York City Health Commissioner Leona Baumgartner sought the city’s inclusion in the first nationwide testing of the Salk vaccine. The testing effort was coordinated by the National Foundation for Infantile Paralysis (later renamed The March of Dimes) and Department of Health staff, and carried out locally by thousands of volunteers. One of many mailings sent to the Department of Health by citizens skeptical of the safety of the new vaccine. Department of Health Collection, NYC Municipal Archives. The NYC Department of Health selected six health districts for the first round of testing based on risk: Corona, Flushing, Gravesend, Lower East Side, Richmond and Tremont. Beginning on April 27, 1954, 40,000 school children in grades 1-3 were injected with either the vaccine or a control substance. The testing effort was coupled with a massive publicity campaign including television, radio, posters, pamphlets and film trailers. The success of the vaccine would not be assessed until the following polio season and there was some fear and skepticism about its safety and efficacy. During the first phase of testing, popular columnist Walter Winchell claimed on television, radio and in print that the vaccine “may be a killer,” incorrectly reporting the vaccine contained a live virus. Federal officials worked immediately to dispel Winchell’s claims and ensure the safety of the vaccine. In April 1955 the Salk vaccine was declared successful and the New York City Department of Health under Commissioner Baumgartner began a systematic program to inoculate school children right away. In the first year 899,010 New York City residents were given the vaccine. By 1956, 45% of New Yorkers under age 20 were inoculated. Elvis Presley receiving a polio shot in October 1956 from Assistant Commissioner Dr. Harold Fuerst. Commissioner Baumgartner holds Presley’s arm while Fuerst administers the vaccine. Department of Health Collection, NYC Municipal Archives. Letter from Dr. Leona Baumgartner, Commissioner of Health, to Elvis Presley, 1956. Department of Health Collection, NYC Municipal Archives. The Department of Health even enlisted Elvis Presley to help make the case for young people to get vaccinated. In October 1956, Presley was photographed, filmed and interviewed while he received the shot on a trip to New York. Commissioner Baumgartner can be seen holding Presley’s arm, while Assistant Commissioner Dr. Harold Fuerst administered the shot. The widespread inoculation was absolutely necessary to stamp out polio in New York City but the project was often hindered due to its high cost. The publicity, staffing of health centers, vaccinations, and numerous other expenses strained the city budget. Not until the passing of the Federal Vaccination Assistance Act of 1962 was the city able to fully realize the large scale inoculation of the public. The Act provided grant funds to distribute polio and other vaccinations to children five and under, free of charge. Once flexible funds were available, a total of 3,624,670 doses were distributed in New York City in 1963 alone. 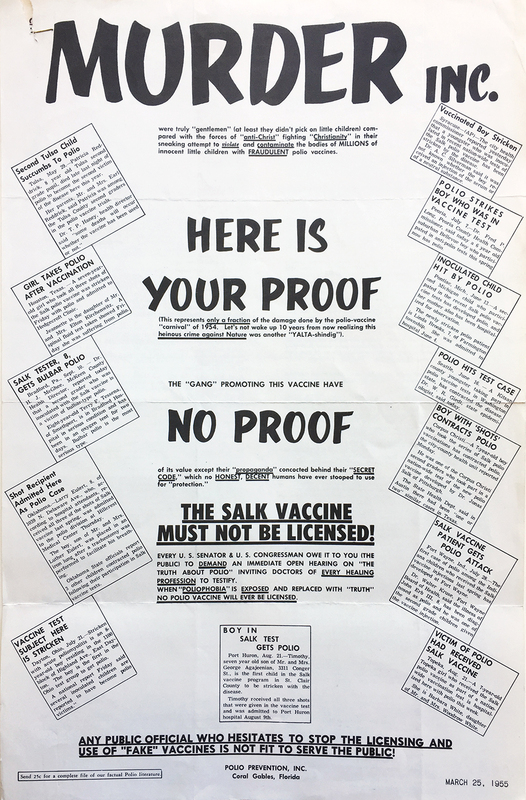 Explanatory chart depicting the success of Salk vaccine in preventing new cases of polio. Department of Health Collection, NYC Municipal Archives. Department staff and volunteers outside mobile vaccine station on 84th Street and Amsterdam Avenue in 1961. Department of Health Collection, NYC Municipal Archives. Graph depicting reported polio cases in New York City from 1951 to 1963. Department of Health Collection, NYC Municipal Archives. In September 1963, Health Commissioner George James announced that not one polio case was reported and/or confirmed in the previous year it for the first time in New York City’s recorded history. However exciting the news of a polio-free year was, the statement was not accepted without scrutiny. There was a great deal of suspicion that the polio vaccine could very well infect a person with the disease it was meant to repel. In 1963, seven unconfirmed cases of polio were reported to the Health Department, but their legitimacy was never determined. In one case, a man contracted serious polio symptoms immediately after inoculation. He was tested for polio but the initial results were reportedly lost by the hospital and/or physician, raising concern in some quarters about the safety of the vaccine. Regardless of the unconfirmed polio cases, Commissioner James continued to claim that 1963 was a year free of polio. Number of polo cases in New York City from 1954 to 1963, from Vital Statistics, Department of Health, NYC Municipal Library. Even if the vaccination may have caused a handful of polio infections, it quickly proved its worth. After initiating the widespread polio inoculation the contraction rate drastically fell. Between 1955 and 1962, only 577 cases and 42 deaths were reported in New York City. On a yearly basis, the death count fell by 91% and the number of reported cases fell by 87%. These results proved the vaccine effective and even presented the possibility of total eradication. Nevertheless, George James remained vigilant. Leery of complacency, he warned the public and private health sector of a possible reemergence. Cover of Spanish-language informational pamphlet about the polio vaccine from 1959. Department of Health Collection, NYC Municipal Archives. The next few years were largely polio free except for a few cases in 1964. Even as polio outbreaks faded from memory, the city and state continued to strengthen the offense against polio. In 1965, the New York State Legislature passed a bill which required any child to receive a polio vaccination before attending public school. During the first years of vaccination, children and young people were the primary recipients, but as the years progressed, more and more adults received the vaccine as well. The city’s defense against polio grew stronger and stronger. With the help of the government and private health sectors of New York and the United States, the massive polio inoculation was predominately a success. Polio contraction rates plummeted in a surprisingly short amount of time, saving hundreds of lives and eradicating a major health scourge of the 20th century. The distribution and promotion of the polio vaccine in New York City served as a model for many states and cities in their battle against the devastating disease which is poliomyelitis. Polio display, Jamaica Health Center, August 31, 1955. Department of Health Collection, NYC Municipal Archives.